For a lot of people, the holidays are their favorite time of the year. It’s a time to celebrate with family and friends, but all of those celebrations can quickly derail your diet. Holiday festivities are typically filled with calorie-laden food and drink, and it’s tough to resist the temptation just to have a bite or two (or ten!) of your favorite holiday foods. All of the fun of the holidays is usually accompanied by some holiday weight gain, and it’s one of the reasons so many people choose to join a gym right after the New Year. 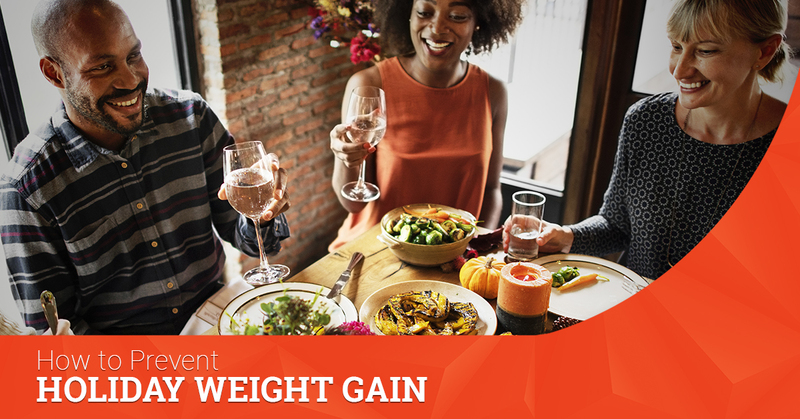 But what if you could skip the weight gain while still enjoying the holidays? It’s actually possible! Here are some tips on how to make it happen from our personal training team in Newtown Square. The hustle and bustle of the holiday season often leave us sleep deprived. That puts you at risk for weight gain. When you are tired, you are much more likely to make poor decisions when it comes to your eating habits. Lack of sleep can increase your stress levels, too, making you even more likely to binge on bad food choices. Make sure you are getting in your eight hours a night and you’ll be better equipped to make smart choices for your health during the day. Fill up on healthy foods first. Before you head out to a party, munch on some healthy foods first. Have a salad or an apple at home because you face a buffet of tasty treats. Feeling full will help you say no to the items in front of you, and knowing that you’ve already made a smart choice for your diet will make you less likely to sabotage it later on. Keep a stock of pre-party healthy snacks at home, focusing on fruits, veggies, and proteins to help you feel full. When you do eat at a holiday party, try to do it as slowly as possible. It takes some time for your brain to receive the message from your stomach that you are actually full; in fact, it can take about 20 minutes for those two to talk. So the slower you eat, the less likely you are to fill up on unneeded calories. Eat slowly, pausing in between bites. This will allow your stomach time to send those “I’m full!” messages to the brain. An occasional indulgence is okay! It is the holiday season, after all. Treat yourself to an occasional treat, but do it sensibly. If you just can’t resist your grandmother’s fudge, have a small piece. Don’t gobble down an entire box of it. By giving yourself permission to enjoy the occasional treat, it makes it less likely that you’ll throw out all of your self-restraint and completely derail your diet. Holiday beverages are some of the worst offenders when it comes to calories. A couple drinks of eggnog can have you hitting your total calories for the day, and we won’t even get started on those fancy coffee beverages. Avoiding holiday beverages can help you cut calories while still being able to enjoy some of your favorite holiday foods. Drink water, tea, and black coffee throughout the holiday season and you should enter the New Year without those extra pounds! Need More Tips for the Holidays? Our Personal Trainers Can Help! If you want to look your best for all of those holiday parties, working with a personal trainer can help you stay accountable, motivated, and inspired to reach your fitness goals. Let’s get to work! If you are already a member, ask our team how you can get a free hour of personal training at Ellis Athletic Center. If you aren’t a member, the best time to join is now! Sign up today.